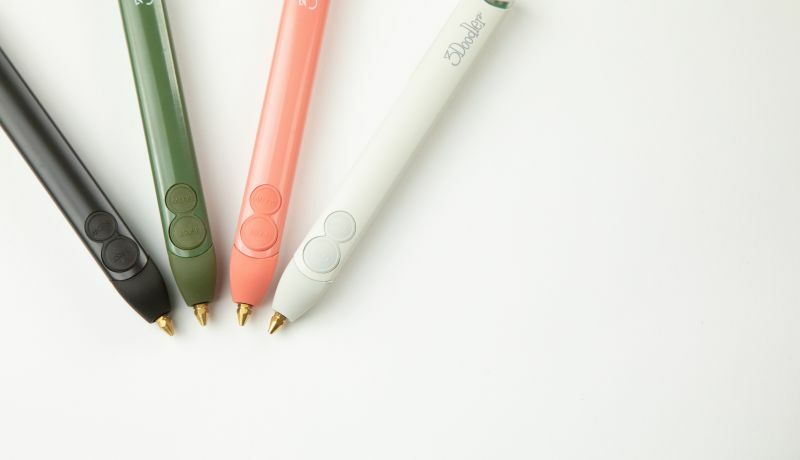 The world’s best-selling 3D printing pen just got better. NEW YORK, New York - 3Doodler (www.3doodler.com), makers of the original 3D printing pen and one of the few 3D printing products widely adopted for consumer use, has today announced the newest edition of its legacy Kickstarter product, the 3Doodler Create+ (Create Plus) Pen and its 2018 Create Product Line. This includes a range of on-trend Home Décor & DIY Project Kits and several STEM-focused products that are both fun and educational. Having sold over 1.4 million units to date, 3Doodler is unmatched when it comes to making 3D printing more accessible, and the 3Doodler Create+ continues that tradition. The Create+ introduces the world’s first dual drive system in a 3D printer, leading to effortless loading and operation for a wider range of plastics, including PLA, ABS and FLEXY, not to mention dramatically fewer jams. Other major improvements include a new heating algorithm for enhanced performance, auto retraction to prevent oozing, auto sleep for safety, more distinct fast and slow settings, an overhauled and more intuitive unboxing experience, all coupled with unrivaled 24-7 multi-channel customer support. The latest version of the world’s first and leading 3D pen, the 3Doodler Create+, was designed with makers, artists, designers and craft lovers in mind. The re-engineered dual drive design incorporates hundreds of refinements making it intuitive, stronger and more reliable than its predecessors. With pen sets starting at $79.99 MSRP, the Create+ stays true to 3Doodler’s core value as a maker of accessible and easy to use 3D printing devices. Inspiring and enabling creativity with a ground-breaking, quality product, all without breaking the bank. The 3Doodler Create+ is compatible with all existing 3Doodler Create Plastics, Canvas Series, and Project Kits. Currently on Amazon and 3Doodler.com, the 3Doodler Create+ will be available wherever 3Doodler products are sold including Target, Best Buy and Barnes & Noble this summer. The 3Doodler Create+ Essential Pen Set has an MSRP of $79.99, which includes the pen and three packs of plastic. The Create+ Deluxe Pen Set has an MSRP of $99.99 and includes the pen, the best-selling Nozzle Set, a Mini DoodlePad® and four packs of plastic. The Create+ Master Creator Pen Set will retail for $149.99 and include the pen, Nozzle Set, full-size DoodlePad, 144-page Project Book, new A-to-Z Bookends Canvas, plus six packs of plastic. 2018 CREATE EXTENSIONS: STEM, HOME DECOR AND HANDBAGS, OH MY! Everything you need to create your masterpiece is at your fingertips with the 3Doodler Create Project Kits. Express your craftsmanship with DIY home, outdoor or workplace decor. In addition to more than 200 free projects online, 3Doodler is also excited to announce several new additions to its series of Project Kits and Canvases. New for 2018 is the Animal Heads Kit, allowing anyone to create impressive wall-mounted geometric decor, the Bookends Canvas, ready for your personalized touch, the Clutch & Purse Kit, featuring a modern floral or wave cross stitch style, the Decorative Lights Kit, which will inspire even the most hesitant crafter to want to do it themselves, an Engine Kit, enabling anyone to bring a twin engine or a V8 to life, and an Advanced Robotics Kit, allowing your Doodled creation to move freely. MSRP on all Project Kits and Canvases are just $29.99 and available at many locations where 3Doodler is sold. The new 3Doodler Artist’s Bag is a perfect carry-all for the 3D savant. Available on its own (MSRP $39), the Artist’s Bag is a stylish and ultra-tidy way to hold a Create+ Pen, around 200 plastic strands, a Nozzle Set and JetPack® or power adaptor, for in home storage and on-the-go. Set to be released later this year, it promises to be a great gift for all organized creators. Those who already own a 3Doodler v.1, 2.0, or Create pen, can take advantage of an attractive trade-up bundle offer from June 1 to take their Doodling to the next level with the Create+. More information about this opportunity can be found at www.3doodler.com. Owned by WobbleWorks Inc, 3Doodler is a technology company making creativity tangible through its range of 3D printing pens and accessories. Founded in 2010, the company went on to raise $3.89 million on Kickstarter to support the production of the world’s first 3D Printing Pens. 3Doodler now makes products for all ages and skill levels of creators whether they’re 3D sketching, tracing shapes from templates or creating architectural models or entirely unique 3D structures. Headquartered in New York, 3Doodler 3D pens and accessories are now available online and in brick-and-mortar retail stores in more than 60 countries. To see the full 3Doodler product range, learn more about the company, download hundreds of free projects or see how the 3Doodler can make an impact in education, go to www.3doodler.com.